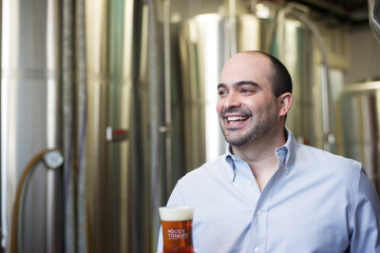 Brewmaster Jared Rouben will open a tasting room at his Moody Tongue Brewing in Pilsen. PILSEN — Moody Tongue Brewing will soon open a tasting room adjacent to the brewery in Pilsen. Moody Tongue brewmaster Jared Rouben announced plans to open the intimate tasting room that will serve year-round and limited-release beers with "Michelin-minded service" at a press conference at Green City Market in Lincoln Park Wednesday. The new tasting room will serve 12 taps of Moody Tongue brews alongside a curated food menu, Rouben said. Moody Tongue will also begin offering tours and tastings led by the brewing team on a first-come, first-serve basis when the tasting room opens. The curated menu will feature a daily selection of fresh oysters, as well as slices of cake. Moody Tongue will work with designers Jesse and Colleen Neuhaus of Mo Faux Studio to design the space. The tasting room plans to open five days a week to start, with exact hours to be announced closer to opening. Rouben opened Moody Tongue Brewing Company, 2136 S. Peoria St., in 2014.